If you’re the adventurous sort, you can still take the Outcroppings Trail, a set of stairs and paths up to the Chimney. There are some great views from the Outcroppings. This is also the trail to take to the Chimney if you have pets. Chimney Rock is pet friendly and dogs are permitted in all the outdoor areas, including all the trails, on leash. 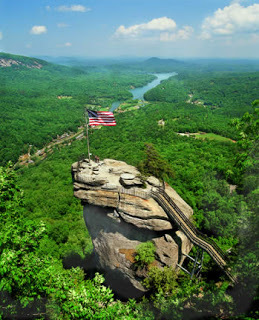 For more information about Chimney Rock Park, visit www.chimneyrockpark.com. And remember: we have discount coupons at the Inn on Mill Creek for our guests who are planning to spend time at Chimney Rock so be sure to pick up a coupon when you stay with us.